There was a summer during my teen years when I routinely sat around my aunt’s pool in baggy sweaters and baggy stretch pants insisting that I was “fine.” I’m from New England where the temperatures vary, but summer is still fairly hot so I doubt I was actually “fine.” I vividly remember one ensemble being a combination of a hot pink long sleeved sweater and yellow pants. Yikes! I obviously refused to get in a bathing suit that summer. I have been self-conscious about my body for as long as I can remember. Bathing suits have been the absolute bane of my existence for many years. Junior high swimming was anxiety provoking. Thank goodness for makeup sharing induced pink eye or rather spraying the hair spray a little too close to my eye about 10 minutes before swim class so I could go to the school nurse and feign pink eye. Worked like a charm as did menstrual cramps, headaches and oops I forgot my bathing suit. In order to makeup the swim classes I missed all I had to do was swim 20 laps after school. The swim instructor allowed me to keep a T-shirt on over my bathing suit and there was no one there anyway besides the swim team who paid no mind to the random two or three people making up missed swim classes. Twenty laps was no trouble. I actually love to swim. I simply hated getting in the pool during swim class with all of my peers, boys and girls. I was quite a good swimmer though. Twice the swim coach approached me about joining the swim team and twice I replied sure despite having no intentions of joining. In retrospect I regret that decision to this day. That is the one and only thing I would change if I had a do over because I believe it would have inadvertently altered the course of so many other events in my teenage life. I’ve never been comfortable in a bathing suit. I have a quintessential pear shaped body so exposing my legs is nothing if not embarrassing. Only recently with the advent of the skirt tankini have I been able to feel even remotely comfortable on the beach or at a swimming pool. I initially felt a bit elderly, but then I found a couple of cuter styles of skirt tankinis. A flattering bathing suit for my figure and continued positive changes to my body have given me the confidence to wear a bathing suit when the need arises though I still keep my cover up or sun dress on as long as possible. This past weekend I was in Florida with Carlos visiting my Dad and his girlfriend. It was a quick three night trip and it involved being in a bathing suit 90% of the time. We swam at his condo pool, the beach and on Saturday we spent the day at a water park. Initially at the water park I kept my cover up on, but quickly realized that it would simply be a nuisance because there were too many fun rides so I relegated all my belongings including the cover up and my flip flops to a locker. I walked around a water park for nearly 7 hours with nothing but my bathing suit on. You know what…I felt absolutely fantastic. OK I didn’t exactly feel like I could grace the pages of the Sports Illustrated swimsuit issue. I simply felt normal. I felt comfortable for the first time in nothing but a bathing suit, albeit a skirt tankini. I didn’t think about my weight, or how my body looked in the bathing suit. I was comfortable in my own skin. I wanted to shout how good I felt or at least share it with someone. I didn’t do either. I just kept reveling in my head how worth it this journey has been. I’m so glad that despite my ups and downs with my weight I have never fully given up. I am grateful that I persisted and found a way to make fitness a priority in my life. I am proud of myself for continuing to learn more about nutrition, try new ways of eating and delve into the reasons why I’ve been overweight for so long. After having my son I knew that I didn’t want to watch my him grow up while sitting on the sidelines of life. I wanted to be right there in the thick of it, running, playing, experiencing life with my family. I vowed that my weight issues would never inhibit my son’s life. Saturday was a really significant day for me. It was the first time I had ever been to a water park with my son. I rode every water slide, jumped in the pools, lounged on a tube while floating down the lazy river and sat at a picnic table for lunch in nothing but my bathing suit. What kind of bathing suit do you wear? Are you comfortable in it? I just bought my first two piece that isn’t a tankini in a very long time. I love it, and no, I am not super comfortable in it, but I think being with the sailor really helps my bikini confidence, if that makes sense. I don’t love being exposed in it if I am not swimming, but it’s not a terrible anxiety thing while I am swimming. I agree Errign that when I’m in the water I’m fine, but getting in and out of a pool or sitting around with a bathing suit on has always been very uncomfortable and awkward for me. I hope by the end of the summer you are feeling much more comfortable in your two piece. Catalina I suspect that you look fabulous in a bikini. I can appreciate a woman who has a lovely figure that is flattered by a cute two piece. I think wearing a swim suit is a combination of feeling comfortable and looking tasteful. We were at the beach recently when a rather voluptuous women was walking down the beach with a skin colored thong bikini on letting it all (and I mean all) hang out. Although she clearly had the confidence to wear such a suit I’m not sure it was the most tasteful selection! Yay – that is awesome!!! So excited for you! I know what that means … I’m really not comfortable in a bathing suit either. And I know before we have any kids I do want to get my body issues under control. I’m glad you had fun at the water park! Thanks Jane. I was equally worried about passing my body image issues onto a girl or a boy. I’m so happy to say that my son is not aware of my weight struggles and negative body image. We did have a great time at the water park, even better because I wasn’t so worried about how I looked. I used to always swim with t-shirt cover-ups when I was younger. Why, oh why? But mostly when I read this post, I was thinking about what you did for your son — not only did he get to enjoy the day with you, but part of me just thinks about what these kind of experiences mean for his future wife — very hard to put into words, but it’s that underlying message that it’s not all about appearance (though obviously I’m sure you looked great), just the self-love and acceptance, it’s wonderful. Sorry I can’t shape the thought more coherently. I have always told myself that my child would not be burdened by my weight issues and my weight would never stop me from enjoying everything with him. Carlos has never heard me say things like I look fat. Thank you Carina. I knew exactly what you meant. What an amazing feeling that must’ve been to feel comfortable in your bathing suit!! I am so happy that bathing skirts have become more widely available. I’ve got an hourglass shape, too (although my hourglass has a lot more sand than yours does! ), and the skirt saves me so much. My most recent suit flatters me so much that I actually don’t feel self-conscious at the pool, even when there are teenagers there. Love that feeling! Aw Bella but you’ve tipped that hourglass over and you’ll be losing lots of your sand. You definitely have great fashion sense something I seriously lack. I envy that. I’m so glad you found a bathing suit that you feel comfortable in. The skirts are much more flattering on my figure as well. Hi Aimee! Loved the picture! I’m glad you were able to just be happy in your swimming suit. I bet that other people are not concerned with your figure, as much as you have felt in the past. I also had that feeling when I went from loose shorts to tight yoga capris. Honestly, they enhance the small tummy lump I have, but I can do better exercises in them without worrying about coverage. So I wear the yoga capris and get very focused on what I’m doing, versus what I look like. And confidence looks good! You are so right Marion. I don’t think there has ever been anyone in my life more critical of my body than me. I have gone through much of my life assuming that others were looking at me in disgust or disapproval. I projected how I felt onto others. It has been a very frustrating way to live. I have also changed what I wear to workout and I am not hating what I see in the big gym mirrors anymore. It’s a lot easier to see progress when my clothes fit nicely. I love my yoga capris and tank tops! I really wish I was comfortable in my skin. I’m working on it and I’ll get there! I choose a tankini for myself. Anything one piece and everything looks all smooshy, no matter what size it is. I have a long torso. 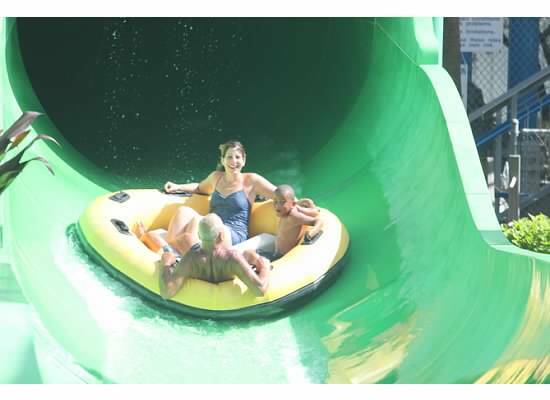 I love the picture of you and your family going down the water slide! That looks like so much fun! You will get there Emily. I’m not sure I would ever feel comfortable in a one piece or a bikini. I like that there are more swimsuit options these days. It was a blast Kaye. Thanks! I HATE bathing suit season. Which is so sad, because I LOVE the beach and the water. I am embarking on a 10 day trip that will be mostly spent in a bathing suit. Every year I say it will not be like this, and yet here I am again. Glad you found your comfort zone! I’ve spent so many years dreading summer for the same reason. I am hoping that is changing for good. I hope you have a wonderful trip. This is a very good “story” and kind of sad too. I’ve been pretty self-conscious about my body too, and I think it started when I got my periods at age 10 (almost 11). It was too early and I think I’ve never learned to accept my body the way my sisters and my mother have. The way I feel about my body now depends a lot on my moods and of course whether I’m overweight or not.